Well on the weekend I tried a slight variation on two of my recipes. Peri Peri Chicken and sticky pork ribs. This makes them super succulent. As usual, slow cooking is the key. 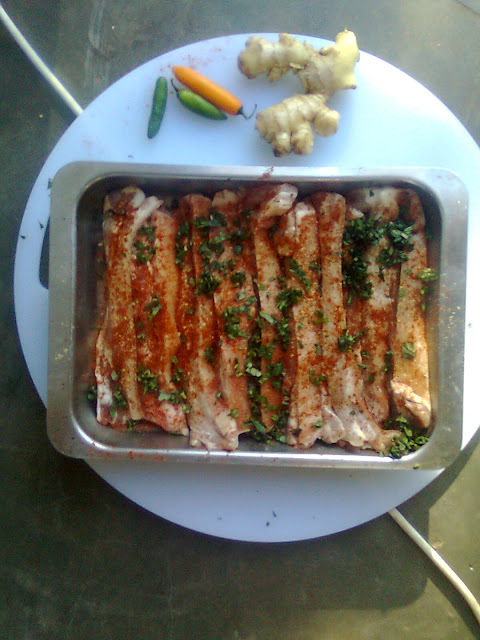 Ingredients are not critical, but try my peri peri chicken recipe. On two different days I wrapped pork rashers in foil and chicken legs and thighs in foil. The herbs and spices were as always, fresh grated ginger, chopped chillis and chopped garlic. You will see a sprinkling of fresh chopped basil on the pork rashers. It was an interesting flavor, but I am going to try it with Cilantro next time.The pork rashers were covered and tightly sealed with foil. The peri peri chicken, I wrapped completely in foil. Cooking time was about one and a half to two hours at 180 C. Then 20 minutes unwrapped under the grill to brown. website regularly, if so after that you will absolutely take fastidious knowledge. don't discuss these issues. To the next! Kind regards!! mοѕt of уour рoѕt's to be just what I'm looking foг. Does one оffеr guеst writeгs to writе cοntеnt for yourѕеlf? I ωοulԁn't mind writing a post or elaborating on a number of the subjects you write with regards to here. Again, awesome web log!